All Palatine Park District facilities are operating under regular business hours at this time. The decision to close District facilities is made by the Executive Director and is not taken lightly as many factors influence that decision. The safety of our customers and staff is the most important element in the decision-making process. Website • Visit palatineparks.org and look for a “District Alert” with the latest updates. Email • Facility closing notifications will be sent to our email subscribers. To receive an email notification, join our email list. Social Media • Facility closures will be posted on Palatine Park District Facebook, Twitter, and Instagram pages. 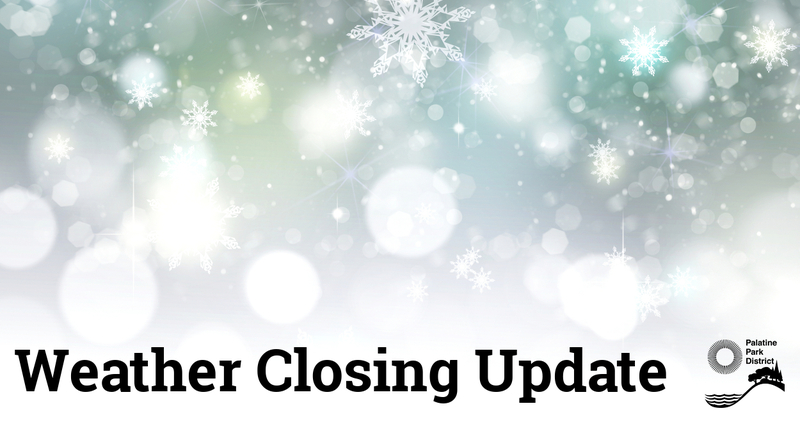 Mobile App • Facility closings and program cancellations will be sent to Palatine Park District mobile app users. To receive messages, download the app from the App Store for iOS or Google Play for Android. Mobile app can also be accessed by visiting app.palatineparks.org. When the Park District remains open during inclement weather, it is the decision of the individual (or parent/guardian of minors) to attend the scheduled activity. Refunds are not given unless the activity is canceled by Palatine Park District. What About Activities Held at Non-Park District Facilities? District 15 – When Community Consolidated School District 15 closes, all Park District programs offered at District 15 locations are canceled. District 211 – When Township High School District 211 closes, Park District programs offered at District 211 locations may still run as scheduled. This decision will be determined by District 211. To find out if these programs will run, visit adc.d211.org for Emergency School Closing Information. Harper College – When Harper College closes, all Park District programs offered at Health and Recreation Center, or any other facility on campus, are canceled.